Inkjet printer ink is the most expensive liquid that most of us purchase on a regular basis. A typical cartridge contains less than a half ounce of ink. At $30.00 a pop, costs mount quickly. Do the math: it can run $6000 per gallon and up! For years printer companies have made their profits on ink, not their printers. Addicted, we keep buying their ink because we have no other choice. Brother has recently introduced a compelling alternate solution: Printers with replaceable, high-capacity cartridges (awkwardly dubbed INKvestment Cartridges). 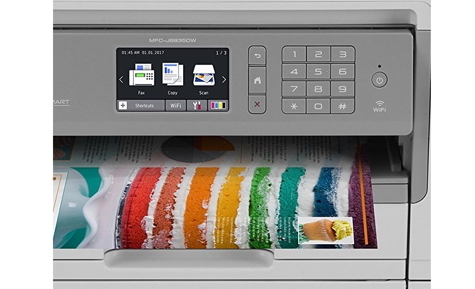 The MFC-J6935DW printer uses $32 black cartridges that yield up to 3000 pages (six reams). The $52 sets of three color cartridges yield up to 1500 pages. This represents a significantly lower price per page that typical inkjet printers — about one cent per black page and less than five cents per color page. Brother considers this a small office or workgroup printer. At $350 it’s fairly expensive, but consider the savings in ink over time. 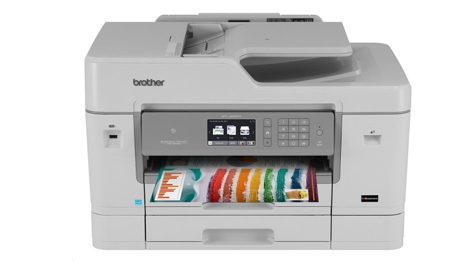 This wireless (802.11 b/g/n) printer offers scanning, copier, and fax capabilities. It provides wired configurations as well. It features two-sided duplex printing as well as one-pass scanning and copying. At 60 lbs. (27kg) this printer is big and heavy partly because it contains two 250-sheet pull-out paper trays that accept paper up to 11” x 17”. With these two trays, it will hold a full ream of paper. At the back edge, there is a 100-sheet capacity multi-purpose tray slot for printing on cardstock, envelopes, or odd-sized paper. A similar model, MFC-J6535DW, has a single 250-sheet paper tray and sells for about $80 less. Set-up is easy. Wireless printers used to be confusing to configure when joining a network, but Brother’s set-up wizard removes most of that frustration. I was up and running in just a few minutes. 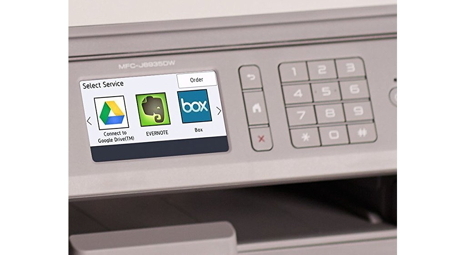 Wireless printing can also be accomplished from mobile devices via AirPrint, Google Cloud Print, Mopria, the Brother iPrint&Scan app, as well as Wi-Fi Direct. The tilting front color LCD panel is a convenient touch screen for set-up, controlling functions, and monitoring status and ink levels. There is even a keypad for faxing if you still do that. There is an NFC touch-to-connect sensor but unfortunately Apple’s iPhones do not yet support this feature. Your own personal Shortcuts can be created directly from the control panel. Some examples: Make two-sided copies, Fax this sheet to Elaine, Make one-sided color copies, Scan to a folder on your computer, Print a photo on glossy paper, and many more possibilities. These customized presets can be huge time savers. Prints, scans, or PDFs can also be made via the USB port on the front of the printer. Color thumbnails appear on the control panel screen making selection visual. Another feature lets you scan directly to web services. Print quality is clean and sharp. Inkjet paper results in the best looking printed pages although normal copy or laser paper can be used with a slight contrast degradation due to ink absorption. Full color prints on glossy photo paper are rich and accurate. All printers are made of plastic and some are pretty flimsy. The MFC-J6535DW feels solid in build-quality and in use. It’s a behemoth with a 22” x 17” footprint, it needs to be placed on a firm counter or desk. Some of the lesser-used functions take several clicks to accomplish—changing the contrast/density of a copy or changing the enlargement setting, for instance. With a multifunction machine, this is not unusual but could be a source of confusion if several people use the printer. The manuals included with the printer are clear and straightforward. If you want more information, the Brother site has more than you’ll ever need. There is an 800-page (!) online or PDF searchable manual that covers the five printers in this product range. There is also a 12-page document covering Apple’s iOS devices and how to print from them. In addition, there are many clear video tutorials that demonstrate how to perform most functions. Brother’s customer service is excellent. You can seek online chat assistance and there is a toll-free help line. Both are staffed with good, knowledgable people. 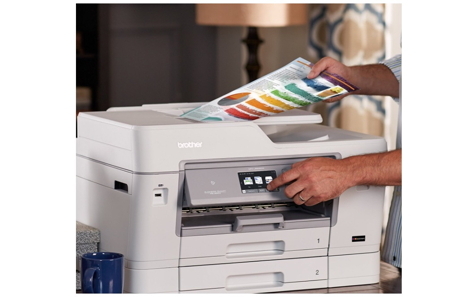 Is a relatively expensive printer with all of these features right for you? It depends on how much and how often you print. I’m a member of a couple of volunteer organizations and an officer in another. Among other things, this involves printing and distributing newsletters, reports, agendas, and meeting minutes. Efficient printing while saving money on ink at the same time makes sense in my situation. If you are involved in an office environment, a careful analysis of your printing consumables is worthwhile; this printer may well represent a cost reduction. Remember when you got a free, inexpensive printer with the purchase of a computer? This is definitely not one of those. I’m pleased with the well-built MFC-J6535DW printer/copier/fax/scanner, the print quality is excellent. I appreciate its many features, the built-in customizable conveniences, and particularly the savings on ink.